An artist from China has sparked controversy after posting photographs of himself lying naked beside the dug-up remains of his father. 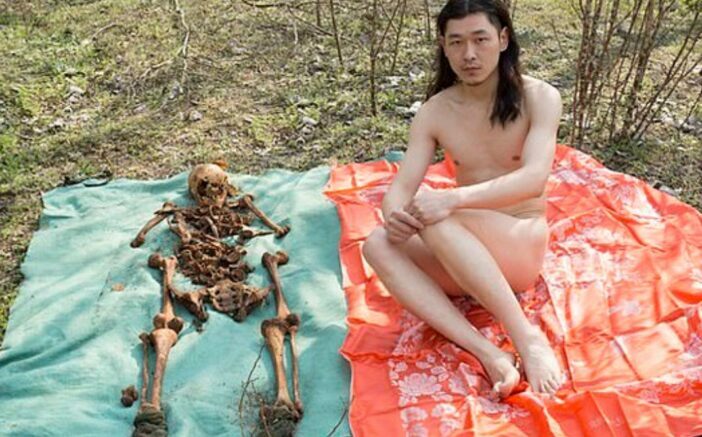 33-year-old Siyuan Zhuji has stated it had been his ‘dream’ to take a picture of himself beside his father’s bones. He had been just three years old when his father died from liver cancer and sadly did not have many memories of him. Siyuan, from Beijing, has described the photo-shoot as being, ‘the closest I’ve ever been to my father’. The photographs were reportedly taken by Siyuan’s wife while his father’s remains were being reinterred due to wear and tear to his grave. The couple had reportedly obtained permission from the cemetery caretaker, who had arranged the bones to form a skeleton in a discreet location. Siyuan shared the photographs on art website Artand, as well as on Chinese microblogging site Weibo, the day after Tomb-Sweeping Day, a Chinese festival which pays respect to the dead. Real art should not be afraid of facing the public or being out in the world. I was also a little selfish, I wanted to realise a dream of mine – to take a photo with my father’s bones. Siyuan revealed his mother was later told about the photographs by his wife, and did not have a problem with what they had done. Siyuan explained, ‘She said if the caretaker didn’t have a problem with it, then she didn’t as well, She is supportive of my work’. However, not everyone was pleased by Siyuan’s art. His Weibo account was suspended on account of the startling photos, but not before plenty of people had expressed outrage at Siyuan’s ‘selfish’ actions. There are plenty of superstitions surrounding ancestral remains in Chinese culture, and many Weibo users felt the treatment of these bones was disrespectful. Young man, disturbing the dead, you will never have a moment of peace for the rest of your life. You’re using your father like a tool for your so-called work of art, against all rules and traditions of filial piety. However, others showed greater appreciation for Siyuan’s work, with one person describing the photographs as being ‘so touching’. Has Siyuan created a moving and expressive piece of art, or has he taken things a bit too far?